One of six state park resorts, Lake Guntersville State Park is located along the banks of the Tennessee River in NE Alabama. The park overlooks the majestic 69,000-acre Guntersville Reservoir, and ranges over more than 6,000 acres of natural woodlands with 36 miles of trails. From the intersection of US Hwy 431 and AL Hwy 227 in Guntersville, AL, take Hwy 227 east to the park entrance. 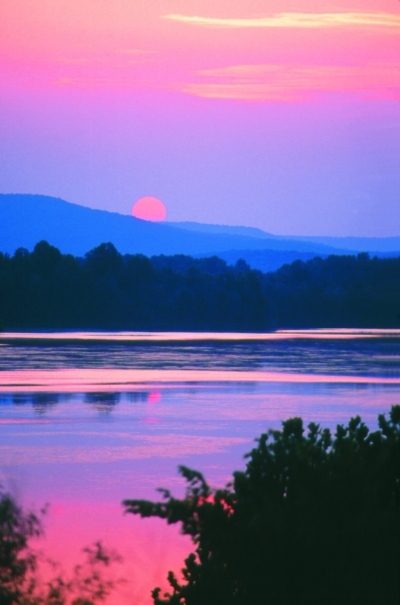 Lake Guntersville State Park is located along the banks of the Tennessee River in NE Alabama. 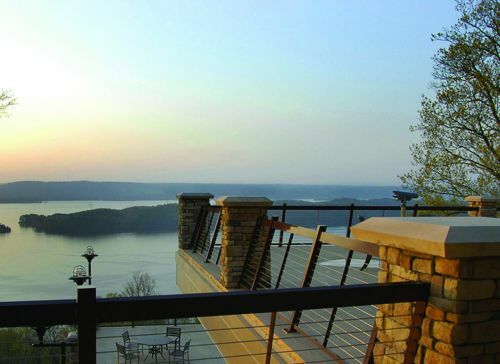 The park overlooks the majestic 69,000-acre Guntersville Reservoir, and ranges over more than 6,000 acres of natural woodlands. The park has an 18-hole championship golf course, a beach complex, fishing center, hiking trails, nature programs and a day-use area. Modern campground and lakeview cottages on the lake, coupled with a resort lodge on the pinnacle of Taylor Mountain, and chalets on the ridge-tops provide a selection of overnight accommodations beyond comparison. The hiking trails in Lake Guntersville State Park traverse moderate to difficult terrain and cover over 36 miles of park property. The trails are varied with some following alongside the banks of the Tennessee River, others lead to seasonal waterfalls, and some that peak your interest just by their name alone such as the Old Still Path and the Moonshine Trail. The trails differ in length from .5 miles to 3.5 miles yet connect with one another to form a loop of trails that add up to 36 miles. Enjoy a short 30 minute hike, guided Saturday morning interpretive hikes, or pack a picnic lunch and head out for a day exploring the ridges, waterfalls and river in beautiful Lake Guntersville State Park. Where mentioned, the "park road" is the loop of roads located off Highway 227 at the entrance to the park that leads to the cottages, campground, chalets, golf course and Lodge. 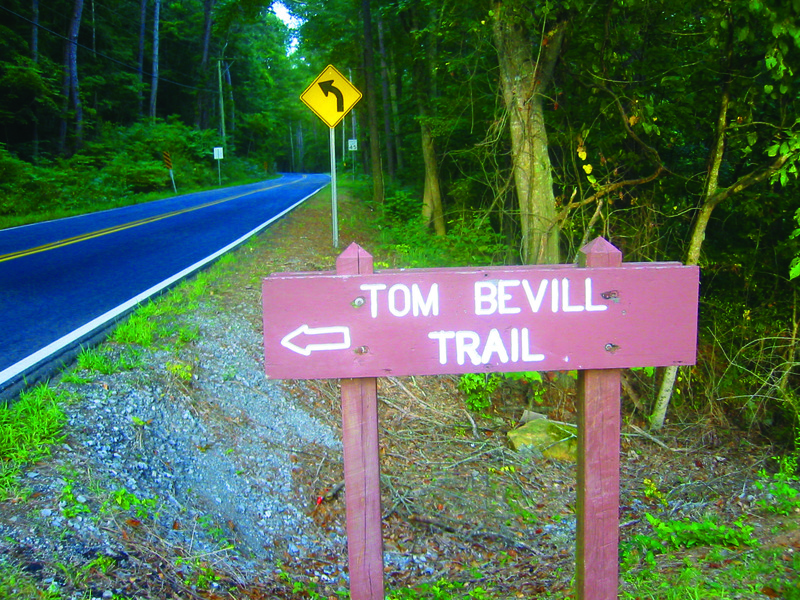 Tom Bevill Trail - 3 miles in length, this trail begins across from the Park Office on Highway 227 and encircles Ellenburg Mountain. Featuring old home sites, this trail was a 1980 YACC project. This path is Moderate. Cutchenmine Trail - 2.5 miles round trip, this trail begins near the Park Office on Highway 227. It follows an old coal mine road along Short Creek and is a good place to spot herons, wood ducks, and other waterfowl. Eagles are sometimes visible from this trail, depending on the seasons. This path is Easy. Old Still Path - .5 miles, this short trail, connects the Waterfall Trail with the Cascade Trail. It passes a well preserved old whiskey still that was on the land before becoming a state park. Notice the “revenooers” ax marks in the remains. This path is Easy. Moonshine Trail - (Note: This trail is currently closed for removal of downed trees from recent storms. )1.5 miles, this trail is located near the chalets and can be entered from the park road or from directly behind the last chalet. The trail connects with the Loop Trail below the chalets and passes the old still site, crossing the park road leading to the lodge. This path is Moderate. 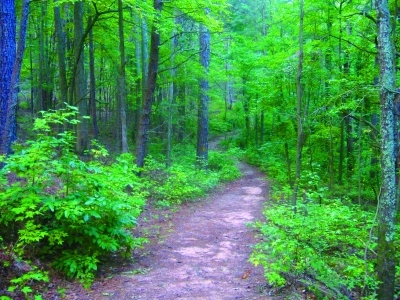 Lickskillet Trail - 2.5 miles, this trail connects the campground to Town Creek and follows an old Indian path dating back to the early 1800's when Cherokee Indians inhabited the region. The trail comes out on Highway 227 just before the Town Creek Bridge, crossing the main park road and a service road. Large beech trees, spring wildflowers, and beautiful fall foliage makes this trail a treat year-round. Add mileage to this trail by taking a loop from the campground to the Meredith Trail to the Seale Trail and winding back up in the campground, for a total of 4 miles. This path is Moderate. Old Lickskillet Trail - 1 mile, this trail may be entered at the Seale Trail in the campground, on the park road above the campground, and on the park road at the top of the hill. It follows a rugged pioneer road with a foundation of an old log cabin visible directly above the campground. This path is Moderate to Difficult. Cave Trail - 1.5 miles, this trail extends from the Tom Bevill Trail to the Loop Trail, passing a small cave. Beautiful rock formations and wild flowers linger along this path that crosses the park road. The cave is just off the road on the right side going toward the campground. This path is Easy. 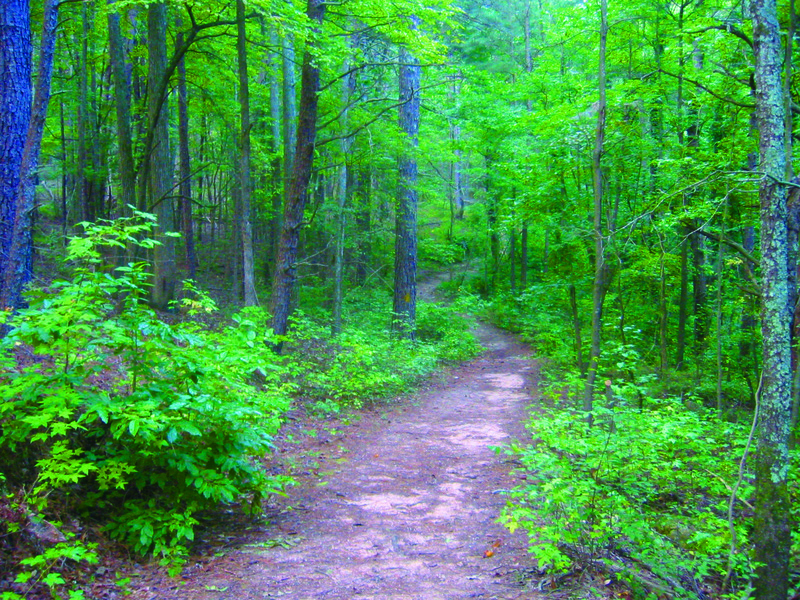 Nature Trail - .5 miles, this trail is located on the mountain directly across from the Lodge. It has access to the Cascade and Waterfalls Trails near the back of this trail. This is a good path for guests of the park to take a leisurely walk after a delightful meal in the Lodge. This path is Easy. Meredith Trail - (Note: This trail is currently closed for removal of downed trees from recent storms.) 2 miles, extending from the Cascade Trail to the Town Creek Bridge and intersecting with the Lickskillet Trail. This path crosses a rocky stream and skirts the outer regions of the golf course. This path is Moderate. King's Chapel Trail - .8 miles, one way, this intriguing trail leads to an old cemetery now located inside the boundaries of Guntersville State Park. Turn onto the park road from Highway 227 and follow the signs towards the Lakeside Cottages. The gated entrance to this trail is on the left before reaching the cottages. After a peaceful rest and viewing the inscriptions on the grave markers, return to the road by way of the King's Chapel Trail or follow the Terrell Trail towards the campground for a lengthier hike. (Notice Terrell as one of the family names on tombstones in the cemetery.) This path is Moderate to Difficult. Daniel's Trail - .5 miles, this trail connects the Loop Trail and the Lickskillet Trail. Feel enveloped by nature with the large trees, boulders, and occasional glimpses of deer. This path is Easy. Spring Trail - .25 miles, this path connects two legs of the Tom Bevill Trail and passes by an old spring that was once a vital water source for Cherokee Indians. The spring flows year round, even in dry weather. This path is Easy to Moderate. Cascade Trail - 1 mile, access to this trail is gained just inside the park's entrance at the 35 mph sign as well as on the back side of the Nature Trail across from the Lodge. This path follows a natural watershed with large boulders, pools of water, cliffs, and wild azaleas, and offers marvelous views from the trails edge. The trail links up with the Waterfall Trail, Old Still Path, Meredith Trail, and Terrell Trail. This path is Moderate. Lodge Trail - 1 mile, this trail begins at the Lodge's playground and descends to the campground. It runs into the Lickskillet Trail directly above the campground. Deer are often seen along this trail. This path is Moderate. Seale's Trail - 2 miles, this trail follows Town Creek from the bridge at Highway 227 to the campground. It offers gorgeous fall color with a vast array of maple, hickory, and beech trees. Named for Rex and Ruth Seale, this couple worked hard hours building our extensive trail system and have continued to mark and maintain trails through the years. They were awarded a Certificate of Merit from Alabama's Governor in 1990. This path is Easy. Terrell Trail - 2 miles, this trail begins on the left side of the road near the campground at a yellow sign post. 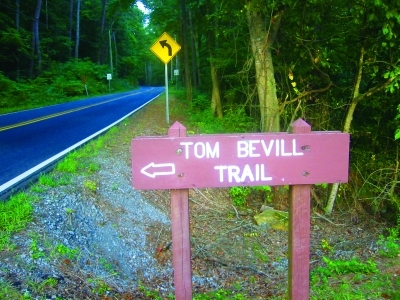 It leads to the Tom Bevill Trail on a closed road and then forks. One direction leads to the old King's Chapel Cemetery on Moderate to Difficult terrain. The other direction is not as difficult a path and follows an old road that goes by unique formations and the old Terrell home-place. The trail also links to a connector trail taking you to the Cascade and Waterfall Trails. This path is Moderate to Difficult. 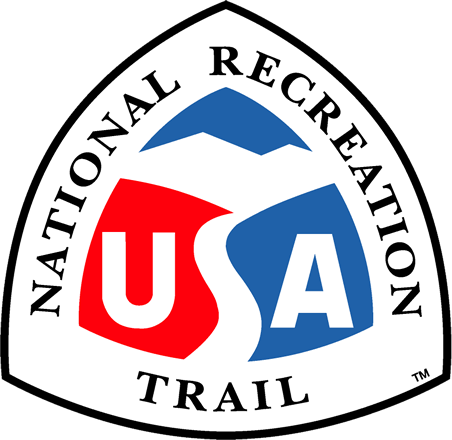 Waterfall Trail - .75 miles, this trail may be entered from the back side of the Nature Trail at the Lodge or from the park road. A small seasonal waterfall is present surrounded by wild azaleas and rocky cliffs. A loop connects this trail with the Cascade Trail making for a very scenic hike. The Old Still Path diverges off the Waterfall Trail about halfway down the hill. This path is Moderate. Golf Course Loop - (Note: This trail is currently closed for removal of downed trees from recent storms.) 3.5 miles, this trail follows the circumference of the golf course. This trail begins across the street from the Lodge and ends at the Lodge playground. It winds around the mountain, crossing a small stream. Watch out for flying golf balls! This path is Easy. Guntersville State Park is one of the premiere birding areas in northeastern Alabama. Renowned for its Eagle Awareness Weekends, the park is best visited in the winter. During this time, look for dense populations of waterfowl, and the chance to spy a vagrant such as Red-necked Grebe or an unusual gull. The woodlands through the park should be checked during migration for a variety of warblers, vireos, tanagers and grosbeaks. Migration is also the best time to search for shorebirds on any exposed mudflats. Wading birds such as Great Blue Heron and Great Egret occur year-round and nest on islands in Guntersville Lake.